"The existence of different versions of history, then, does not show that all versions are equally valid, or equally biased. What it shows is that there is an ongoing tension between historical evidence and the biases of historians, and that the writing of history requires a constant effort to set aside one's biases when looking at the evidence. While "absolute" historical truth may be an unattainable (indeed indefinable) ideal, it is clear that some versions of history are more true than others, and that the business of historians is to construct the truest versions possible." The asserted history and alleged characteristics of Ascetic Shakuhachi Practices in Japan have been most purposefully "constructed" since the very early beginnings. This more or less constantly ongoing activity of deliberate source falsification, forging and fanciful myth fabrication is taking place still, this very day - generated by "professionals" and "amateurs" alike, inside as well as outside of Japan - be they both shakuhachi musicians and players, musicologists and "history" writers, book editors and publishers - beside a wide variety of enough so sincerely devoted shakuhachi "admirers" in general. Very little indeed of what you can find and read in most of the books and articles, in phonogram cover notes and on the internet - be that on websites or weblogs presented in a variety of languages - can actually be soberly corroborated when first one is investigating the totality of known, preserved text and picture source materials etc. - the multitude, comprehensiveness and complexity of which is not only aweinspiring but truly terrifying. The very most central and important fact having so far been revealed is that there were no socalled komusō, 虚無僧 "in existence and action" in Japan before after the quite precise year of 1640! 禅尺八 / 尺八禅 ? - Zen Shakuhachi / Shakuhachi Zen ? and Zen Shakuhachi, 禅尺八, in texts about the shakuhachi before 1977? No, the U.S. japanologist James H. Sanford appears to probably having been the first the use the compound Shakuhachi Zen, 尺八禅, in an article of his published in the highly renowned japanological journal Monumenta Nipponica in 1977. WikiPedia - a trustworthy source of information? Can you - to any "acceptable" degree whatsoever - trust in the information given on WikiPedia.org, English section, regarding "Shakuhachi", "Komusō", "Fuke-shū", and the like and related matters? No, most certainly, definitely so: You can not! The komusō - and the Zen Sect? Were the komusō ever real "Zen monks"? "Regarding 'Zen' and 'Shakuhachi' - there is absolutely no connection!" In early 1977 I was introduced to the renowned professor and fine arts & aesthetics specialist Yoshida Mitsukuni, 吉田光邦, 1921-1991, at Kyōto University. I had just enrolled as a "foreign special research student" at that university (granted for a period of 18 months by the Rotary Foundation International). To be - or not to be: a 'Zen Buddhist Priest'? Right, or more likely: Wrong in Shakuhachi history? True, or rather: False in "Zen Shakuhachi" / "Shakuhachi Zen" "history" ... ? Scroll page down for a select bibliography for this particular web page. 「公認」- kōnin - a "governmental authorization"? Fuke-shū (Fuke Sect) in 1677? No, honestly - no such "clear evidence" at all ... ! 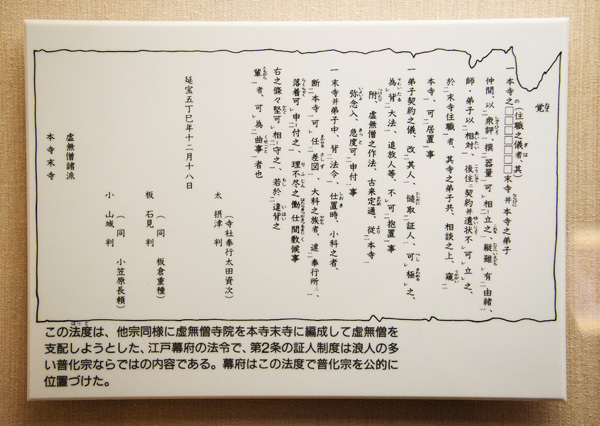 Here you see an annotated reprint of a very important Fuke Shakuhachi related document, exhibited in the Komusō Room of the Matsudo City Museum in NW Chiba Prefecture. This is the vicinity in which the memorable "Fuke temple" Ichigetsu-ji was located during the Edo Period after it had been established at some time towards the end of the 17th century. 覚 - 'Oboe' - Edited reprint of the socalled "Edict of the Enpō Period"
Photo taken by Ronald Nelson in summer 2014. "Fuke Sect" being officially recognized and authorized by the "Temple & Shrine Magistrates" in Edo towards the close of the 5th year of the Enpō Period (1673-1681). The above picture appears to show a photographic reproduction of the actual, original Oboe document. According to the small sign underneath, it a treasure of the Myōan Temple in Kyōto. Photo by Ronald Nelson, summer 2014. Is this really an "Official Recognition and Authorization of the Komusō Fraternity" - a socalled kōnin, 公認? I myself find that extremely difficult to believe as neither the very term Fuke-shū, 普化宗 - nor the shakuhachi, 尺八, for that matter - are mentioned in the text at all. Not even the very central terms Rinzai Zen, 臨済禅, be it just Zen, 禅, appear in the text! That particular date is not valid at all. It never existed! The cyclical calendar sign for the year Enpō 5 was tsuchinoe uma, 戊午 (the 55th of the sexagenary cycle), NOT hinotomi, 丁巳 (the 54th of the sexagenary cycle) as given in the document. In other words: The year in question: Enpō 5, 延宝五 does not correspond with the calendar sign! In fact, the correct date would have been: 延宝五戊午年十二月十八日. How could the official Magistrates of Temples and Shrines have made such a notable mistake? Possibly, very simply, because they did not. This document was most probably created - I mean: forged - by the komusō themselves, and not produced by the Tokugawa authorities at all! You are most welcome to check the date right here on this website, yourself: NengoCalc. First, the shift of cyclical signs from hinotomi, 丁巳, to tsuchinoe uma, 戊午 happened on the 8th day in the 12th month of Enpō 5, which corresponds with the Western date "January 1, 1678"! Secondly, not least - consequently: The 18th day in the 12th month of the 5th year in the Enpō Period did not "fall" in 1677 at all. The actual date according to the Gregorian calender was: January 11th, 1678! Does the term Fuke-shū, 普化宗, "Fuke Sect", appear in any known Japanese text before the year 1687? Did the famous shakuhachi player Watazumi Dōso, 海童道祖 (1910-1992), believe in the widespread and so very popular claim that the socalled Fuke-shū, 普化宗, "Fuke Sect", had ever been officially recognized by the Tokugawa government in the capacity as a "genuine" Rinzai Zen Buddhist sect? No - simple as that! That is the real and plain reason why Watazumi Sensei nicknamed himself Shūso, 宗祖, "founder of a sect"! Were the komusō of the second half of the 17th century in any way "closely affiliated" with the Rinzai Sect of Japanese Zen Buddhism at that time? The terms Zen and Rinzai Zen do not appear at all in any of the surviving Fuke Shakuhachi documents that can be dated to the 17th century. Was the Nezasa-ha, 根笹派, branch of Fuke Shakuhachi during the Edo Period "one of the original 16 sub-sects of the Fuke shu" (John Singer on www.komuso.com)? No. That is a myth! The oldest known reference to the Nezasa-ha appears in a document that can be dated no earlier than 1777 (Yamaguchi 2005:227-228). Is "a ‘Nezasa-ha’ listed as one of the sub-sects of the Fuke sect" in "an ancient document dated 1628" (Justin Senryu Williams on www.senryushakuhachi.com)? No. That is a mistake! 海道本則, which is dated 1628? Is the Nezasa-ha listed in the Kaidō honsoku komosō, 薦僧, document of 1628 (also known as the Boro no techō, ぼろの手帳? No, that piece of misinformation is - as a matter of fact - the result of a rather quite remarkable translation error! Obviously, as you can see, the Nezasa-ha, 根笹派, does not appear on the list. “The komusō temples in various places - The branch sects [lit. : cliques/factions] after the komosō era. I have already quoted [him] two or three times, but among the records of the Kōkoku Temple which Nakatsuka Chikuzen investigated there is "The Boro Memorandum" [Jap. : Boro no shuki] (temporary name). The author is unknown, but it is a text [lit. : a "thing"] in which a certain Boro (komosō) explained the circumstances of the komosō in question & answer fashion, and it is dated the 5th year of Kan'ei (1628). At the end [of the document, under the headline] "The komosō founder Abbot Fuke's sect has 16 branches" [it says]: 'The Wakasari Branch, The Yoritake Branch, The Kinzen Branch,' to mention but a few. Likewise, because during the early years after the establishment of the Fuke Sect there is also being said to have been 16 branch sects, there was the possibility to succeed [or, continue] the factions [Jap. : habatsu] from the era of the komosō. At Kōkoku-ji, Nakatsuka examined the document called Boro no Techō. The author (name unknown) was a boro (another name for komosō) who wrote in a question and answer style explaining the ways of the komosō. Dated 1628, it ends with the phrase (partly quoted above): "Master Fuke was the founder of the komusō of which there are 16 sects," and it lists the sects as the Yōtaku Sect, Gibun Sect, Shirin Sect, Impa Sect, Yūnan Sect, Nogi Sect, Chigo Sect, Kogiku Sect, Kinsen Sect, Kassū Sect, Umeji Sect, Kichiku Sect, Nezasa sect, Fuchi sect, Tanjaku sect, and the Sūwa Sect. When the Fuke sect was established there were also 16 sub-sects, therefore it is likely that they came from these komusō sects." The discrepancy bweteen the original and the adaption is obvious: The two different branch sect lists described in Kamisangō's article have been mixed up by Christopher Blasdel to become only one, dated 1628 - while the latter can actually only be dated towards the end of the 1700s. Also, Blasdel mixes up the two terms of komosō and komusō - do note that there were no komusō in existence before around 1640, or so. Christopher Blasdel's text - with even more errors, regrettably - from 2008 has also been published on the website www.komuso.ch. Is 'Mu', 無 (Chinese: Wú), in English: "None-ness", originally a Zen Buddhist concept? Mu was introduced into human thinking by the earliest Taoist philosophers of ancient China, at least two and a half millenia ago. See for instance Chapter 81-6 in the oldest extant Taoist scripture, the Tao Te Ching. Was the idea of 'Fu-shō, fu-metsu', 不生不滅 (Chinese: 'Bù shēng bù miè'), in English: "Non-born, non-perished", or: "No birth, no death", conceived by the Chinese Zen Buddhist thinkers of old? 'Fu-shō, fu-metsu' was introduced into human thinking by the early Taoist philosophers of ancient China, more than two millenia ago. Was Fuke Zenji (9th century) the first Zen Buddhist monk in history who, allegedly, presented a now recorded statement regarding the dualistic concept of 明暗, "the Bright and the Dark"? Before Fuke Zenji, the renowned Chinese Zen patriarch Hui-neng (638-713) treated the dualistic concept of myō-an in the "Platform Sutra", and so did another important early Chinese Zen personality named Shih-t'ou (700-790) in his famous discourse "An Agreement for Participating Together". Has Fuke Zenji's famous 4-line Chinese poem attacking the dualistic concept of 明暗, "the Bright and the Dark" ever been properly understood, interpreted and translated? Coming from empty sky, I lash like a flail. Shihō hachimen rai, senpū da. myō-tō da and an-tō da. Here, the words myō-tō and an-tō have been made objects, not subjects, of the verb da, "to hit" or "to attack". Something similar goes for lines three and four: There is noone, no subject, that hits neither "like a whirlwind", nor "like a flail". Kokū appears, Flail hits [or: a harvesting knife cuts]." "Four quarters and eight directions" should probably be understood in the meaning of "whatever", or maybe: "wherever from"? As for Kokū, 虚空, literally "empty sky", rather refers to the Indian philosopher Nagarjuna's central concept uf shunyata, "non-substantiality", in Japanese: Kū. We should, however, not at all rule out that ko here may rather carry the meaning of "imitated" or "false"! Fuke Zenji certainly must have been polemizing on both Huineng and Shih-t'ou's previous sayings regarding the duality, be it the mutuality, of the very "pair" of Myō and An. An afterthought: Do we actually know for certain that Fuke Zenji really lived back then in the first half of the 9th century and that he acted and spoke as it has been reported in the Lin-chi Lu / Rinzai roku? No, to tell the truth! : We cannot know for certain, can we ... ? Is the shakuhachi flute known to having ever been blown by Buddhist monks in China? Has the term komusō, 虚無僧, ever been translated properly? The proper and much more "precise" rendering in English should be: "Monks of the Non-Substantial (or, Non-Dual) and No-one-ness". Were there any socalled komusō, 虚無僧, in existence during the earliest decades of the 17th century? No, that is indeed completely out of the question! Were there any socalled "Fuke temples" in existence during the most early decades of the 17th century? No, no positive evidence, whatsoever. Simply impossible! Is it in any way possible that the Keichō no jōsho, 慶長掟書, "Ordinance of the Keichō Period" (1596-1615), allegedly formulated and signed by the first Tokugawa shōgun Ieyasu, could have been created in 1614 (Berger 2001 quoted by Day 2013)? No, plainly speaking: simply impossible! That document is a forgery which has been copied and elaborated upon many times throughout history! Is there any evidence that the first version of the Keichō no jōsho, 慶長掟書, could possibly have been produced exactly in 1677? We do not even know how the first version of the (constructed) document looked like. Acc. to Max Deeg, the oldest surviving version of a Keichō no jōsho is dated as late as 1792 (Deeg 2007:27). However, we do know that some early version of this mysterious and utterly controversial document was indeed in existence during the period of 1681-1685 when the daimyō Inaba Masamichi (Inaba Masamori, 1640-1707) was in office as Temple and Shrine Magistrate (Mikami (2) 1902:66-67; Linder 2012:23). a person called Kyōgen composed this. Among a million soldiers you hear it - but do not see.'" In the 'Taigenshō', maki 5, chapter on Shakuhachi. Source: Toyohara/Masamune, 1933, vol. 2, pp. 630-631. Truly, Ikkyū Sōjun is also well known under his literary artist name Kyōun, 狂雲, "Crazy Cloud". In the Taigenshō, however, the name of the author of the poem(s) is given as Kyōgen, 狂言, "Crazy Words", which is in fact the name of a specific form of medieval Japanese theatre that originated during the 15th century in connection with the Nō theatre. In fact, a very similar version of the poem about "cutting off Dulism" is contained in the kyōgen piece Rakuami, 楽阿弥, which is possibly the oldest piece in the kyōgen repertory. 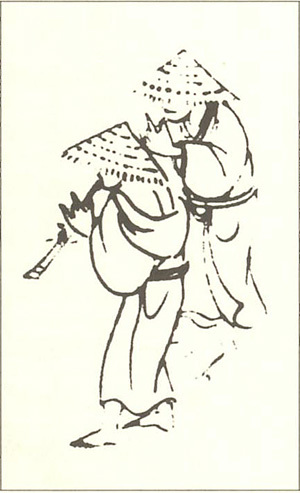 Furthermore, yet another version of that poem is to be seen on a painting of the flute player Rōan, 朗庵, that was, allegedly, created in 1477. It remains a fact that the role of Ikkyū Sōjun in the history of early Fuke Shakuhachi and "Zen Shakuhachi" in general is being greatly exaggerated, be that both in and outside of Japan. Did Ikkyū Sōjun really use the shakuhachi "prominently in his practice" and write poetry "about its meditative qualities" (Rubin 2009:223)? No, there is absolutely nothing in any of Ikkyū's poems that indicates that he may have been using a shakuhachi specifically as a "tool of meditation"! Can it really be that the early komosō, 薦僧, of the 15th century were "Zen practitioners"? No, they were much more likely lay "monks" practicing and preaching various popular forms of Pure Land Buddhism (or even Shingon Buddhism ... ?)! What is going on in present-day socalled "academic" shakuhachi research, writing and publishing activity? No, so very certainly not. There were no socalled komosō in existence in the thirteenth century. The picture shown by Dr. Wong Wah-sang (Associate Professor at the University of Hong Kong) in his 2014 article is dated as late as 1661, printed in the Edo Period publication Ukiyo monogatari, 浮世物語, "Tales from the Floating World", by Asai Ryōi, 浅井了意 1612-1691 (Ueno 2002: 218). Did the medieval komosō, 薦僧, become extinct towards the end of the 16th century? No, we certainly know from the Kaidō honsoku, 海道本則, document, dated 1628, that komosō must still have been active during the first three, or even four, decades of the 17th century. Were there any socalled komusō, in Japan before, say 1640? No, the oldest existing document in which the three characters 虚無僧 appear is in a quite personal letter from the renowned Rinzai Zen Abbot Isshi Bunshu (1608-1646) to a komusō named Sandō Mugetsu, 山道無月, being dated to 1646. Is it any way possible that Abbot Isshi's letter to Sandō Mugetsu could have been written as early as in 1598 (Linder 2012:151)? No, Isshi Bunshu was born as much as 10 years later, in 1608, and died in 1646. It is true that - acc. to a genealogy and death register of the Reihō-ji in Edo, dated 1841 - a certain Sandō Mugetsu, 山道無月, is said to have died in 1598 (Keichō 3, Nakatsuka 1979:113). However, the part of the register covering the period before 1677, or so, is definitely a completely unreliable fabrication. Could the original Kyotaku denki, 虚鐸伝記, "History of the Imitated Bell", have been written before Abbot Isshi's letter to Sandō Mugetsu? Could the legend about Hottō Kokushi, 法燈国師, returning to Japan (in 1254) together with four Buddhist laymen have been in existence already in 1628? No! Although at first sight the reprinted versions of the Kaidō honsoku document of 1628 open with one sentence (headline) written in kanbun that carries that piece of information, that sentence has obviously been added to the scroll at a considerably later date. Do we know with any probability whether Ton'ō, 遁翁, alleged author of the original Kyotaku denki text, was a "Zen Buddhist monk"? Was Myōan-ji, 明暗寺, the first Myōan Temple in Kyōto - as being claimed so very often - established by a certain Kyochiku Ryōen Zenji, 虚竹了円禅師? Kyochiku is not a historical person at all - he can never have lived and was, apparently, "invented" as late as during the early 1700s! Quite reliably, Myōan-ji's actual founder (at best, possibly sometime during the later decades of the 17th century?) was Chūkō Engetsu Ryōgen Zagen, 中興淵月了源座元, who is recorded to have died in the 8th year of the Genroku Period, i.e. in 1695. For your info: chūkō means "restorer" - of a temple, in this case. Was the term sui-zen, 吹禅, popularly translated as "blowing Zen", in existence during the Edo Period (1603-1867) or before than, for that matter? The term sui-zen came into use as late as at the time when Higuchi Taizan, 樋口対山 (1856-1914), and others formed the Myōan Kyōkai, 明暗協会 in 1890. Is it known from any known, surviving 17th century Fuke Shakuhachi related text that the komusō used the shakuhachi flute for "meditation", specifically? No, such "evidence" is completely non-existant! Is it possible that the very first shakuhachi "came to Japan from China in the 3rd century AD" and that "Over that time it has been used extensively by Zen monks for meditation" (Abbot: centertao.org)? No, neither of these claims can be confirmed to be "true"! Are the oldest existing shakuhachi in Japan those being preserved in the Shōsōin treasury in Nara, dating from the mid-8th century? No, quite probably not! It is actually possible that a shakuhachi having survived among the treasures of the temple Hōryū-ji in Nara is even older. Did the Tendai Buddhist monk Ennin, 圓仁 (posthum. : Jikaku Taishi, 793/794-866), who travelled and studied extensively in T'ang China from 838 through 847 ever really "play" or "accompany the reciting of" the Amida Sutra on a shakuhachi (Linder 2012:98; Rubin 2009:222-223)? No, that's impossible - and a myth, too! Ennin would only have employed the instrument mainly for intonation. Did Ennin found "a monastery at Tōfuku-ji (Tōfuku Temple) in Kyōtō which in the seventeen[th] century would allow the komusō to set up a sub-temple called Myōan-ji (明暗寺 - also called Meian-ji)" (Wong 2014:66; Philip Horan, shakuhachizen.com)? No, of course he did not! Ennin was a Tendai Buddhist monk who lived from 793/794 to 866. The Rinzai Zen temple Tōfuku-ji, 東福寺, in SE Kyōto was founded only in 1236. It was not Ennin, but Enni Ben'en, (圓爾辯圓, Chinese: Yuan'er Bian-yuan, 1202–1280), who was put in charge of founding the Tōfuku-ji! Did the Buddhist monk Kakua, 覺阿, ever play a bamboo flute face to face with Emperor Takakura, 高倉 (r. 1168-1180), in the late 12th century? No ... no way - that's just another myth, probably constructed only centuries later! Donald P. Berger & David W. Hughes: 'Shakuhachi'. ed. Sadie Stanley and J. Tyrrell (London: Macmillan, 2001): Vol. 12, 831–836. C. R. Boxer: The Christian Century in Japan, 1549-1650.
towards an understanding of blowing Zen." "Blowing Zen: the Fuke shakuhachi lineage in the Chikuho ryū." Vols. 32 & 35: Section on Music. Kurihara Kōta: Shakuhachi Shikō. Chikuyūsha, Tokyo, 1918. Kurihara Kōta: Shakuhachi Shikō. Chikuyūsha, Tokyo, 1975. Ph.D. thesis, University of Sidney, 1993.
the same subject, University of Copenhagen, Denmark, 1987. In: Dan E. Mayers, editor: Annals of the International Shakuhachi Society. Vol. 2. The International Shakuhachi Society, 2005, pp. 138-155.
sectes bouddhistes, provinces, d?partements, mesures, etc. with notes ny T.L. Southgate. London, 1893, 1909, 1969. Norman Stanfield: The Kinko-ryū and its San Koten Honkyoku. M.A. thesis, University of British Columbia, 1977.